Ghosh R (2013). “Asthma and occupation in the 1958 birth cohort”. Thorax, published online 22 January. European Environment Agency (2013). Late lessons from early warnings (vol.2). Occupational rhinitis (OR) is associated with occupational asthma in almost 60% of cases, according to a French study that investigated the relationships between the two conditions. The authors suggest that symptoms of OR should be taken into account in the medical surveillance of workers exposed to agents known to be linked to occupational asthma. Ameille J et al (2013). “Occupational asthma and occupational rhinitis: the united airways disease model revisited”. 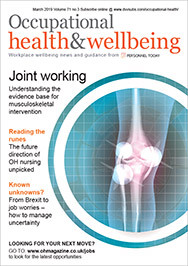 Occupational & Environmental Medicine, published online 6 February. Increasing obesity among employees is the most important contributor to rising healthcare costs in the US, and the main reason why workplace wellness has worsened since 2005, according to a study of data from health risk assessments completed by 341,650 workers. Goetzel RZ et al (2013).”The workforce wellness index: a method for valuing US workers’ health”. Journal of Occupational & Environmental Medicine, published online 8 January. The number of incidents of violence against staff in the retail sector fell by 55% in 2012, according to the latest crime survey by the British Retail Consortium. However, the number of overall incidents of crime rose, as did the cost of this crime, which was up to £1.6 billion, the survey said. British Retail Consortium (2013). “British retail crime survey 2012”. Work is often one of the most important things in the lives of women recovering from breast cancer surgery, according to a Swedish study that spoke to women recovering from cancer four to eight weeks after their surgery. Two-thirds of the women viewed work as one of the most important things in their lives; 85% said that their job provided personal satisfaction; and 54% said that their vocational situation was satisfying. Older women and those with higher education were more likely to state that they valued work. The authors concluded that the results of their research make it essential to include aspects of work early on in treatment and rehabilitation plans following cancer surgery. Petersson LM et al (2012) “How do women value work shortly after breast cancer surgery and are their valuations associated with being on sick leave?” Journal of Occupational Rehabilitation, published online 22 November. A 52-year-old worker at JCB has received an out-of-court settlement after he developed dermatitis from being exposed to brake fluid and a rust inhibitor while working for the firm in Rochester. The man had worked on the production line since 2003, but his skin condition first began in 2010 when he moved to a job bleeding brakes and connecting radiator hoses. After informing managers, he was moved to a role just connecting hoses but his condition then worsened. An OH nurse investigated the cause of his complaint and discovered that the fluid emitted from the radiators was not dirty water, but a rust inhibitor, and he had not been provided with protective gloves. In a case dating back to 1996, a group of employees at Sheffield-based metals company Firth Rixon have been awarded a total of £686,000 in compensation after suffering vibration white finger. The latest awards follow a previous pay-out in relation to Firth Rixon in 2006, when 19 employees of the firm recovered total damages of just over £125,000 for the same condition. Nine of this original group of claimants who had continued working at Firth Rixon, plus another employee, took a further claim late last year as their condition had deteriorated, resulting in the latest settlement. Royal Brompton and Harefield NHS Foundation Trust has been fined after three employees were exposed to a strain of multi-drug-resistant tuberculosis (TB) when a test vial smashed in a laboratory. On investigating this issue, the Health and Safety Executive (HSE) identified numerous issues with the management and maintenance of the containment facility used at the trust. These included: inadequate risk assessments for activities involving TB; no safe system of work; a failure to examine, monitor and test critical control measures; and poor emergency arrangements in the event of an incident. No employees suffered any adverse effects, but the HSE said that the trust should have developed and implemented a safe system of work to prevent incidents. The trust was fined £12,500 and ordered to pay £25,000 in costs.